Florence’s cathedral stands tall over the city with its magnificent Renaissance dome designed by Filippo Brunelleschi, with the baptistery of St. John right across. The cathedral named in honor of Santa Maria del Fiore is a vast Gothic structure built on the site of the 7th century church of Santa Reparata, the remains of which can be seen in the crypt. Can you imagine it took two centuries for the cathedral to be deemed finished? The church was consecrated as soon as the dome was in place although the façade (front of the church) was only half finished by then. It was just decoration, and thus remained unfinished up until the 19th century. At that point, it was actually redone by the likes of the time and finally finished! The exterior is covered in a decorative mix of pink, white and green marble. The interior, by contrast, is pretty stark and plain but quite enjoyable on warm summer days since the temperature inside tends to be cooler. The mosaic pavements are certainly its main attraction within. Since it is one of the most visited monuments of Florence, the Duomo is hard to enjoy, especially if you visit it in crowded tours, where you can’t discover all its secrets and you can’t visit it in total relax, with your time to admire every single masterpiece in this marvellous cathedral. 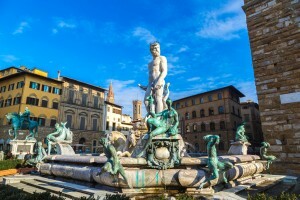 A Private Tour in Florence maybe the best way to enjoy this church and to visit also the best monuments in Florence, like Uffizi or the Accademia, where you can see the David statue.